Even though fall is my favorite season, I love May and June. It’s warm, but not too hot, and flowers are blooming…And this year, my wedding anniversary falls on Father’s Day, and last month, my son Jack’s birthday fell on Mother’s Day! I’ll soon be on the way to a very fun city out west to help celebrate my sis-in-law’s milestone birthday with a bunch of other members of the family. I’m told there will be T-shirts! I’m appearing from 7pm to 9pm on June 15th at The Snug Gastro Pub in Canton, GA with 4 other local authors to do a book reading and sign books. Publicity update: If you missed the Neighbor Newspapers/Marietta Daily Journal article about me and the Georgia Author of the Year Award nomination of ALL THE ABOVE, click here to read. Winners (and finalists) will be announced this Saturday night by the Georgia Writers Association. I now have a personal/profile Facebook page (“Julie McDermott“), AND an author/fan page, created some time ago (“Julia McDermott, Author“)! If you’re my FB friend on the former, please “Like” me on the latter (I’ll probably invite you to, if I haven’t already). Stay tuned for future announcements on publicity about me in the news! It’s on my personal FB page, but ALL THE ABOVE is a nominee for the 2016 Georgia Author of the Year Award in the Memoir/Autobiography category! Three trips are on the horizon, so far, and they’re all “out west” – one in April, one in June, and one in September! It’s only October 2nd, but I’m going to be so busy this month that if I don’t get this done now, it won’t happen. It’s Promotion month for UNDERWATER: Yesterday through October 31st, you can download my Suspense novel set in my home town of Atlanta for only $1.99! 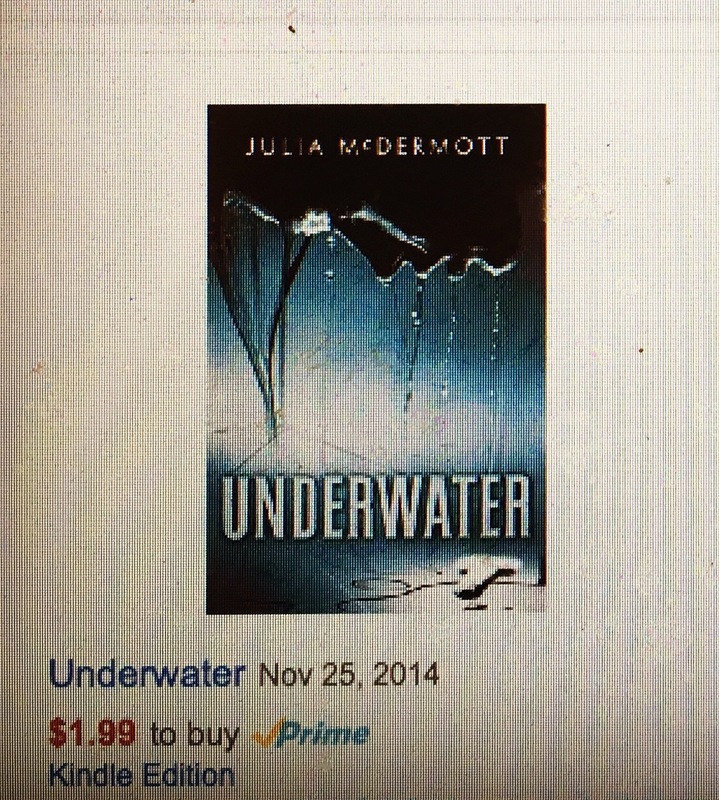 UNDERWATER is an Amazon HALLOWEEN KINDLE BOOK DEAL. Look for it under Mysteries/Suspense — Suspense — Psychological! My trip to Raleigh is fast approaching! I’ll be a “Dark Romance and Dark Smiles” Panelist at Bouchercon next Friday at 10:00 a.m, and the next day I’ll be at the New Author Breakfast bright and early at 7:00 a.m.! Note: even though I’m a graduate of UNC Chapel Hill, I once worked in Durham, have visited Duke, and have flown in and out of RDU several times, this will be my very first trip to the state capital of Raleigh. I hear it’s nice. And I feel pretty comfortable in that neck of the woods, anyway. At the end of the month, I’ll be at the Killer Nashville International Writers Conference with some Atlanta Sisters in Crime! My first time at this conference, and my third time ever (I think) in Nashville! November Preview: in between 2 quick trips to Florida (I hope) I’ll appear yet again with some Sisters at the Ansley Book Club Meeting in Atlanta! Details to come. 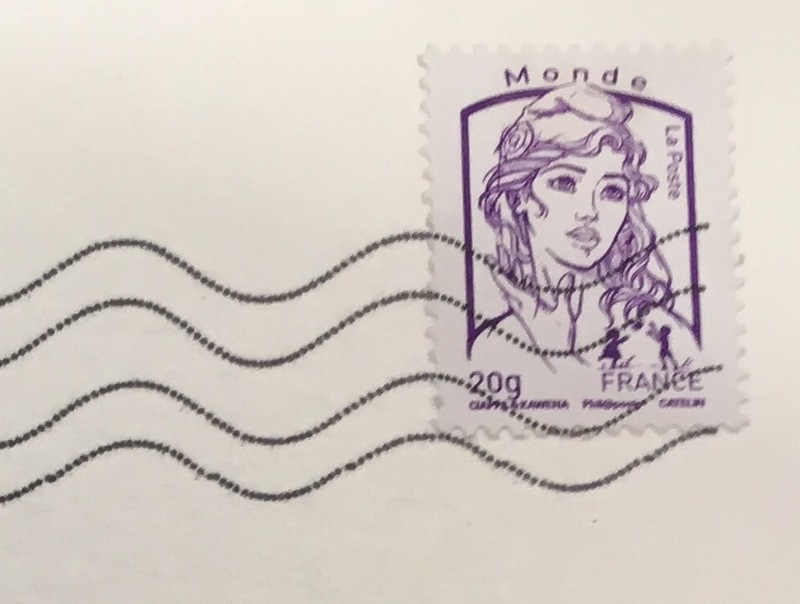 Quoi d’autre? What else? Watching football, of course! Zut! August is almost over, and I haven’t done a list post for it yet! Signing copies of UNDERWATER and ALL THE ABOVE at this year’s Decatur Book Festival on Saturday, Sept. 5 from 4:00 to 5:00 at the Atlanta Writers Club booth! Looking forward to serving on the Atlanta Writers Club Thriller Panel the next day, Sunday, Sept. 6 from 12:00 to 12:45 at the CITY HALL STAGE, then signing books again. Enfin, moderating the AWC Urban Fantasy Panel the same day from 2:30 to 3:15 at the MARRIOTT CONFERENCE CENTER AUDITORIUM. Speaking about my books on a panel at the Atlanta Sisters in Crime meeting on Saturday Sept. 12 from 10:30 to 12:30 with sister authors Sharon Marchisello, Lane Stone, Mary Anne Edwards, and Fran Stewart. 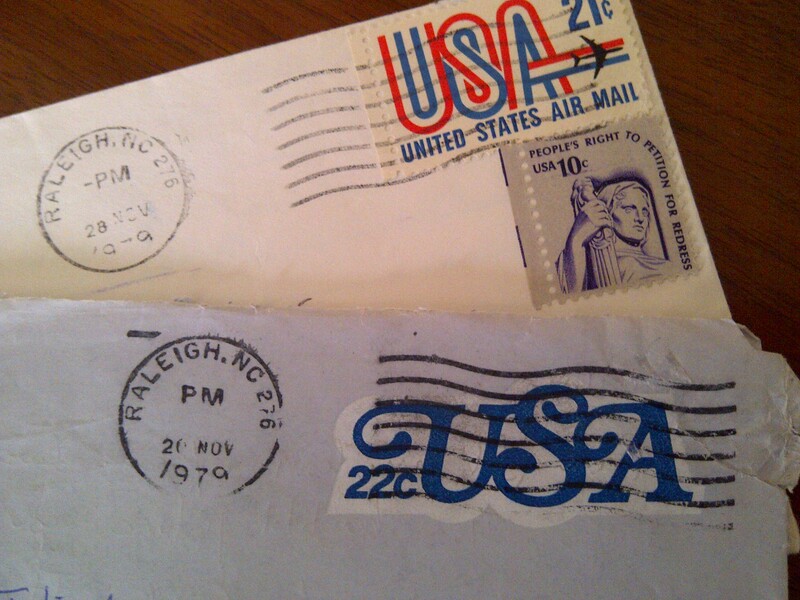 Going to Bouchercon 2015 world mystery convention in Raleigh, North Carolina from Oct. 8 – 11 (more on this later)! Looking forward to meeting readers and signing books at the Book & Art Fair in Griffin, Georgia from Oct. 16 – 18. Appearing at FoxTale Book Shoppe on Oct. 21 in Woodstock, Georgia with bestselling author Hank Phillippi Ryan and some other Sisters in Crime authors! It’s a short list, but it’s a list! 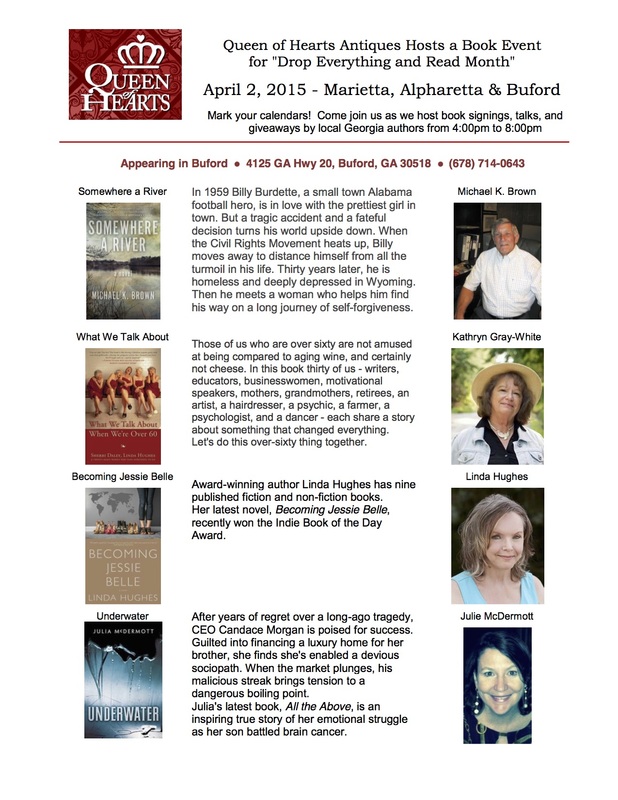 Going to BUFORD, GA today from 4 to 8 pm with other local authors to participate in “Drop Everything and Read Month” at Queen of Hearts Antiques & Interiors! Come pick up signed copies of UNDERWATER & ALL THE ABOVE! Writing WIP (work in progress) daily, the end is in sight! 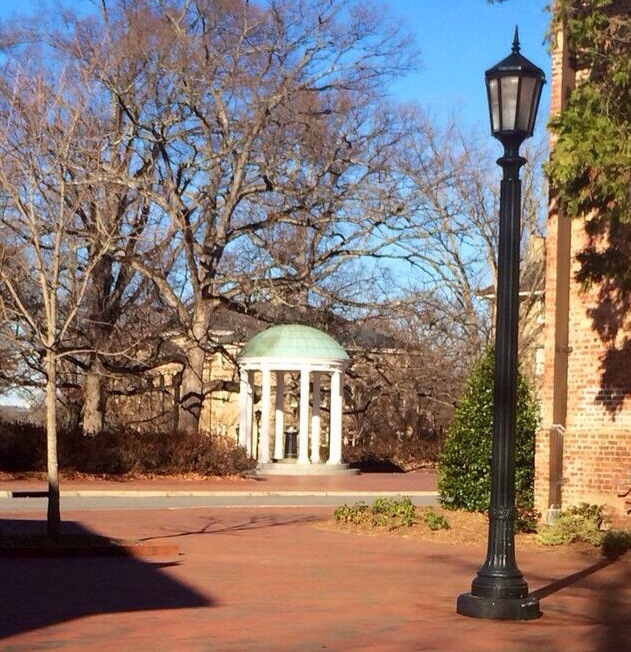 Can’t wait to attend UNC Relay for Life in Chapel Hill on April 17! Help win the fight against cancer! More Birthdays! 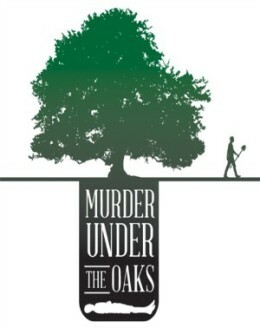 I’ve been asked to participate in an Author Focus panel at this year’s Murder at the Beach: Bouchercon 2014 in Long Beach, California! The annual World Mystery Convention of readers, writers, publishers, editors and others who love crime fiction, thrillers and suspense is being held there over November 13-16, 2014. My Author Focus panel will be at 12 noon on Saturday, November 15! Check out the programming schedule here ! I will be speaking and answering questions about my suspense novel UNDERWATER, to be released in November by Thomas & Mercer of Seattle, Washington. I will also be attending various other panels and activities at the convention, my first Bouchercon! New publishing contract for UNDERWATER! A lot has happened since April 7, 2014. This happened right before my husband and I were scheduled to fly to Austin, Texas to attend a nephew’s wedding, then to Napa Valley for the week. I love getting Facebook messages, and this was a very intriguing one. So, I spent half the night awake doing research, responded to Anh (pronounced “On”) the next morning, and we scheduled a conference call for the day before my travels began. Then, in football terms, it was time for me to revisit the Playbook. 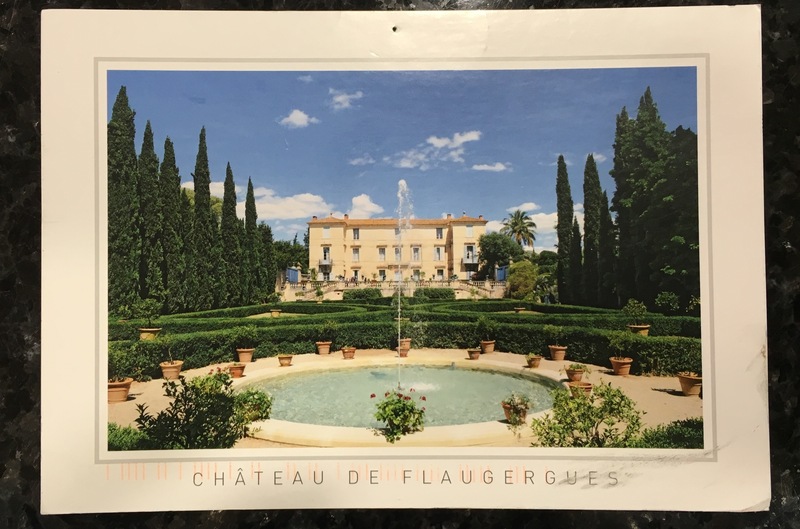 Three weeks later, after a lot of discussion with Amazon, my lawyer’s counsel, and some great California wine, the contract has been signed. Tentative release date for the new edition of UNDERWATER with Thomas & Mercer is November 2014! Now, I don’t know if Anh (or anyone at Amazon Publishing) is a fan of Russell Wilson, or if they read my April 7 post, but serendipity comes to mind.